Description: This popular favorite was a shrunken-down version of the #192 School Bus, and both continued in production throughout the entire original Little People run, as well as into the Chunky era. The main difference between the two was that the School Bus had 2 new people added virtually every year, and contained several rarities like a tan bodied dog and a red or yellow pan head boy. The people used in the mini bus/van on the other hand, stayed basically the same for nearly 20 years and included only 1 exclusive, which was the green body boy with a red cap that was used in the 1988 Pampers Promotional Mini Van. 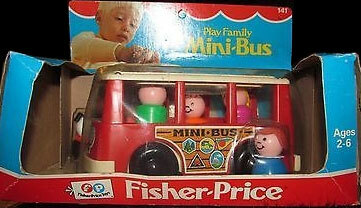 FPT547 - Red body, White top 5-seat mini-bus. Side lithos marked "Mini-Bus", and back litho marked "MADE IN USA". Has a pull-string tab on the front bumper. BQWW - Green dad with black heat-stamped hair. FNWW - Blue mom with a blonde ponytail. CUWW - Orange boy with red heat-stamped hair. FGWW - Blue girl with blonde braids. IVWW - Regular base Lucky dog with a Red collar. The collar has small "dots" on the outside edge. FPT546 - White body, Red top 5-seat mini-bus. Side lithos marked "Mini-Bus", and back litho marked "MADE IN USA". Has a pull-string tab on the front bumper. IPWW - Regular base Lucky dog with a Yellow collar. The collar has small "dots" on the outside edge. ZAWW - Regular base Lucky dog with a Yellow collar. The collar has lines on the outside edge. BQWW or BQWP - Green dad with black heat-stamped hair. FNWW or FNWP - Blue mom with a blonde ponytail. CUWW or CUWP - Orange boy with red heat-stamped hair. FGWW or FGWP - Blue girl with blonde braids. HWWW or HWWP - Regular base Lucky dog with a Red collar. The collar has lines on the outside edge. FNWP or FNPP - Blue mom with a blonde ponytail. CUWP or CUPP - Orange boy with red heat-stamped hair. FFWP or FFPP - Blue girl with a brown sculpted bob. HYWP or HYPP - Regular base Lucky dog with a Yellow collar. The collar has lines on the outside edge. HWWP or HWPP - Regular base Lucky dog with a Red collar. The collar has lines on the outside edge. FPT4542 - Red body, White top 5-seat mini-bus. Side lithos marked "Mini-Bus", and back litho marked "MADE IN USA". No pull-string hole on front bumper. FNPP - Blue mom with a blonde ponytail. CUPP - Orange boy with red heat-stamped hair. HWPP - Regular base Lucky dog with a red collar. The collar has lines on the outside edge. FPT22091 - White body, Red top 5-seat mini-bus. Side lithos marked "Mini-Bus", and back litho marked "ASSEMBLED IN MEXICO". No pull-string hole on front bumper. 1986-1990 Retail Catalogues - 1986 was the first time that this set was called "Mini Van" in the catalogues, and also the first time the Fisher-Price dealer catalogues have ever shown 2 girl with this set opposed to a girl and a boy. We don't know if this was a photo error, or if the set was really sold with 2 girls? FPT8483 - White body, Red top 5-seat mini-bus. Side lithos marked "Mini-Van", and back litho marked "ASSEMBLED IN MEXICO". No pull-string hole on front bumper. CJPP - Green dad with black molded plastic sculpted hair. GHPP - Red mom with a black ponytail. *See "Variations below. HCPP - Yellow girl with a light brown sculpted bob. FPT4547 - Yellow body, yellow top 5-seat mini-bus. 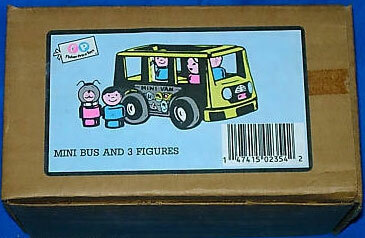 Side lithos marked "Mini-Bus", and back litho marked "ASSEMBLED IN MEXICO". No pull-string hole on front bumper. AEPP - Short blue body boy/man with blue cap. The cap has a "M" shape above the bill (same one used as a pilot in other sets). GLPP - Red (deep red) girl with a light brown sculpted bob. *See Variations below. 1989 Toy Fair Catalogue - 1990 Pre-Toy Fair Catalogue - The catalogue shown 2 girls with this set opposed to a girl and a boy. We don't know if this was a photo error, or if the set was really sold with 2 girls? GFPP - The red body mom used in 1986-1987 & 1989-1990 could have a black bun opposed to a black ponytail. GEPP - The red body girl used in the 1988 Pampers Promotional may have also had a light red body with dark brown sculpted hair opposed to deep red. FPT4544 - White body, Red top 5-seat mini-bus. Side lithos marked "Mini-Bus", and back litho marked "MADE IN USA". No pull-string hole on front bumper. FPT22092 - Red body, White top 5-seat mini-bus. Side lithos marked "Mini-Bus", and back litho marked "ASSEMBLED IN MEXICO". No pull-string hole on front bumper. FPT15102 - Red body, White top 5-seat mini-bus. Side lithos marked "Mini-Bus", and back litho marked "MADE IN BELGIUM". No pull-string hole on front bumper. FPT22093 - White body, Red top 5-seat mini-bus. Side lithos marked "Mini-Bus", and back litho marked "MADE IN BELGIUM". No pull-string hole on front bumper. 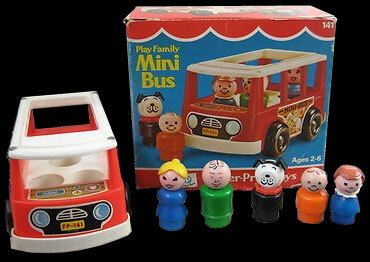 FPT4543 - Red body, White top 5-seat mini-bus. Side lithos marked "Mini-Van", and back litho marked "ASSEMBLED IN MEXICO". No pull-string hole on front bumper. 1984-1985 - This set was sold in a 8-15/16" long, 3-5/8" high, 5-11/16" deep display box. 1986-1990 - This set was sold in a 8-15/16" long, 5-11/16" high, 3-3/4" deep display box. Retail price in the 1971 J.C. Penneys Spring and Summer Catalogue was $2.66. FP141SET1988 - #141 Set MINT IN BOX. WFL: 07-AD-02-B-A.